Causes milk and eggs to rot." Marlene's Thunder Shirt arrived. Just in time too. Poor dog...she is so terrified of thunder and lightning. We are in full-on thunderstorm season and sometimes I wonder if she's just too far gone for anything to help. It's hard to tell but I think this is helping her a little bit. She seems to calm down more easily. I took this photo when the power went out last night during a big storm. Normally she doesn't stay on the bed, she'll try to hide, so maybe that's progress? I'll do anything to help her! The other three dogs slept through the whole thing! 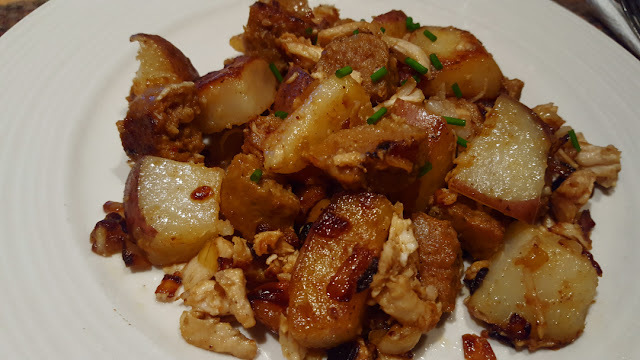 For dinner the other night, I pulled out my "Potato" recipe book and made French Quarter Potatoes. The original recipe calls for it to be spicy and hot (Creole mustard, Andouille sausages, cayenne, peppers)...but I made it to suit our digestions. It has sausages and chicken with a mustard and Worcestershire sauce - VERY tasty and easy to make! Last night's dinner was from the freezer. 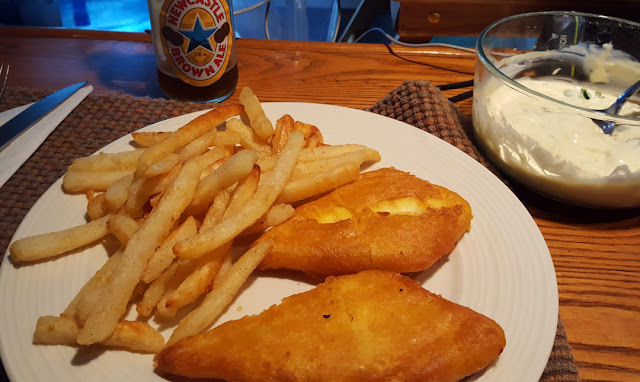 Fish and Chips with a cilantro tartar sauce that I made. It's just my Tartar Sauce recipe with chopped fresh cilantro. It gives it a nice flavour. It was the monthly shopping day yesterday and freezer food on 9 hour shopping trips is a relief! We're all set until August now in the food department! Maybe a trip for fresh veggies in a few weeks, but other than that, I'm happy to stay put and not go further than my porch!! Honestly, I could have bought the ingredients separately as I already have a thermometer, cheese cloth and a brush...plus I'd bought some of the additives already for Mozzarella....but I wanted my first attempt at Cheddar to be easy. The box says "Just Add Milk" so that sounded easy! A good post. Can't wait to see how the cheese-making goes. I'm sure it'll be a success. Thanks for leaving a post on my blog. I hope your thumb is better by the way. Fish and chips is very English and I hope you enjoyed it. It's hard to believe that I went to bed at 6.30pm. It's 7.30 right now and it's still light outside. When you think about it it's a tough lifestyle I lead.. my wife (Mandy) and my son, Jon (25) are all I care about. now though. That's not entirely true. I care about others too. I'll definitely follow you on a new site. Let me know how that goes. looking forward to your cheese making adventures, you can take cuttings from Dianthus. We've been having some terrific thunderstorms lately, too. Last Thursday there was the threat of golf ball sized hail, and winds up to 70 mph! Happily, the brunt of it went a little south of us and all we got was 1-1/2" of rain in about 10 minutes and high winds, but not near 70 mph. Cheese making is something I've always wanted to get into (but apparently not bad enough!) so I will be following your cheese making blog. I do cottage cheese regularly but that's all. So far. Encourage me! Lovely thoughts and photos indeed. That looks like a great recipe too, thanks for sharing. Warm greetings! Aw, poor Marlene! I hope the thunder shirt helps. It's hard for animals to understand these things. It's just terrifying for them. This is thunderstorm season down here in the Blue Ridge mountains, too. Last week lightning hit a cabin and burned it to the ground. It can be nice to watch but I suppose I could do without lightning. I'm sorry about Marlene. That's a gorgeous photo of the moon. Great dishes, too. Thanks. 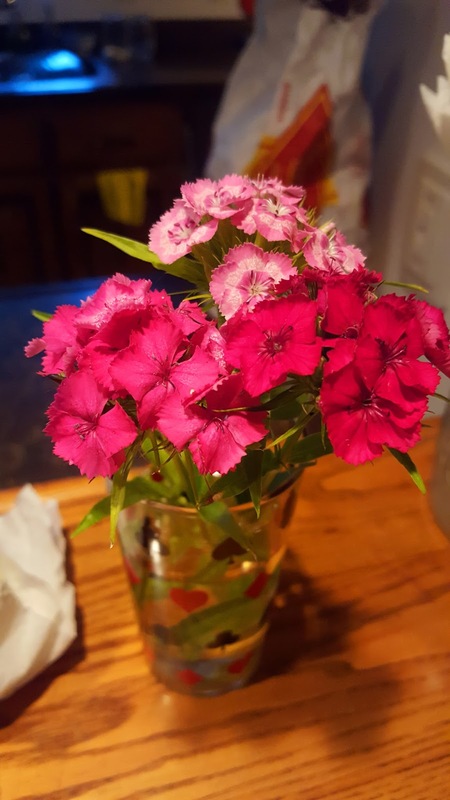 Hi Dawn :) Thanks for the tip on the dianthus! We just love that flower, and this is the first year we found them out in the yard! Hi Mama Pea :) I will try my best to encourage you to make your own cheese!!! It's a daunting hobby at first...I made some yesterday, I'll blog on the new cheese blog...I was so nervous lol...it's JUST CHEESE I kept telling myself! Practice makes perfect! The thunderstorms here are still in the forecast so Marlene's Thunder Shirt is being put to good use! Glad we don't have that hail though! I was in a hail storm once and they were big pieces and I was sure they'd go right through my windshield, it was scary! Hi Harry :) That sounds horrible...one lightning strike can devastate someone's home...when the lightning hits here, it's usually up higher on the mountain and the trees are the ones to take the hit. It is something beautiful to see though. Hi A Cuban In London :) Thanks for visiting my blog :) We got Marlene two years ago, she's a rescue dog...we have no clue about her history, but her fear of thunder and loud bangs is worrisome, it's very over the top. I hope the shirt helps her more and more so eventually she'll sleep through it all like the other pets! The potatoes made my mouth water. I hope the thunder shirt works. Thanks John :) I think we'll find out more tomorrow and Tuesday with 70% risks of thunderstorms. I hope it works for her too! Have fun with the cheese making. I used to make homemade ricotta, cream cheese, fromage blanc and a few others using our fresh goat's milk. Poor Marlene! 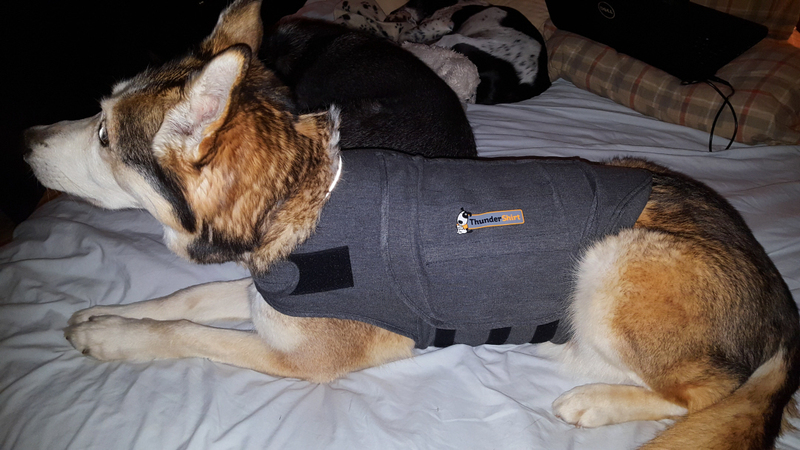 I hope she gets used to the Thunder Jacket and that it helps her...poor baby. The food all looks so good and yummy. I am with you sister....I love staying home and I feel the same way after shopping....being from the North, when my kids were little and we got home with all the groceries I would always say..."let it snow"! LOL! I still do even though it is supposed to get to 91 or 93 today (F). I can't wait to hear about your cheese making adventures and I will probably join you after my company leaves....so exciting! I have been very fortunate evidently. I have yet to have a dog that is bothered by thunder or the 4th of July booms. TTYL! Yay for cheese making! I will get sign up to follow you rainy day cheese blog! :) Love the name! Can't wait to see some cheese! Those thundershirts are supposed to really make a difference - my sister's dog couldn't make it through a storm without his. Our storms seem to go north or south of us. I'm not complaining, believe me. This is the fist time that none of my dogs or cats are bothered by the storms. I'll be interested to follow your cheesemaking adventures - while I've made mozzarella and some other aged cheeses, I have not made cheddar. Hi Nancy :) I tried to make my own version of the Thunder Shirt a few months ago, I used a big large elastic-type bandage to wrap around her tummy and neck but it didn't seem to help much. But basically it is very snug on her. We have to really see if this helps over time. So far, her anxiety is lasting shorter times, so hopefully one day she'll be able to handle the noises without so much fear! Oh, I HATE grocery shopping!!! But I'm the same way, I always seem to need something else. I was pretty good all winter though. I went once every 4-6 weeks and put my foot down on extra trips. Having to shovel out the car was good motivation though lol! Hi Susan :) I really hope it the thunder shirt helps her. When I had my pugs, the only thing that stopped one of their fears was that the poor thing went deaf with old age, then he didn't care at all. She still freaks out and searches for Alex...we'll see as time goes by! I'm looking forward to making the cheddar, that will be a project for this week! 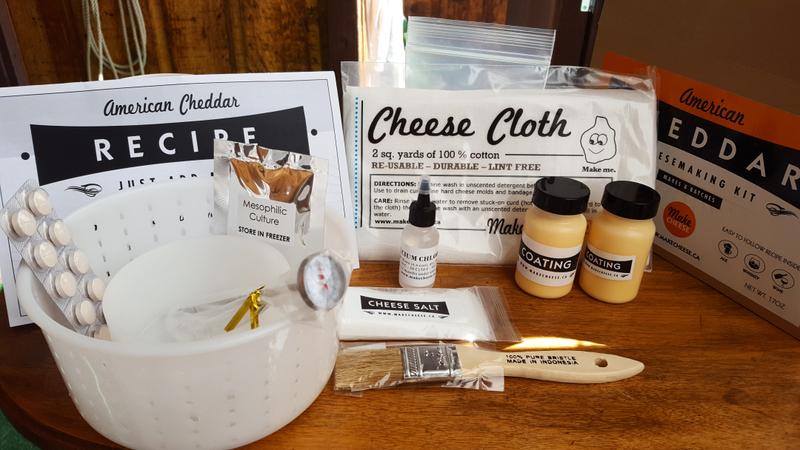 I love the cheese making kit. Where did u order it ? Nik, I ordered everything from makecheese.ca, it's a company in Alberta. There is another supplier in Ontario, Glengarry...but I wrote them 2 emails and they never replied and they have an "iffy" shipping policy. Only thing is, if you order it, make sure you have an 8L pot...you need 6L of milk plus other stuff to make one batch of cheese. I had to order a pot from Amazon so that's why I'm waiting to make it!